For ICU its at least a liter and its 999 ml/Hr. I don't really care to ask much more than that from the provider about boluses because I don't really need to, I know what to do and what my intensivists want or if its for sepsis or dehydration I have protocols for the unit. Hypotension should be corrected, we are protective of MAP and if the patient is less than 60 and symptomatic it is an emergency, if the patient isn't readily fluid responsive after the first liter or two depending on circumstances than I'm getting a vasopressor. If I question what the patient is self reporting then I'll administer the medication deemed appropriate based on my observation of the patient. I'll then document that patient reports pain of 4/10, on assessment patient displayed such and such nonverbal indicators of moderate pain, was medicated with Norco per MD order. Reducing CLABSIs by prohibiting blood draws from line? Agreed, The way we reduced them in my previous hospital was to pull every line possible prior to the patient leaving the ICU. Laziness and poor line management produces CLABSI. Anybody have rituals they do when a patient passes? Clean, tag, bag, call Translife. I completely understand. I've dealt with this for nearly 2 years. It seems that is always some petty little thing I must account for without being given the opportunity to confront my accusers or even speak to the validity of the claims. My patient satisfaction is impeccable yet I seem to always be in the crosshairs and I don't really understand why. When I float to other units I receive rave reviews for my performance and I have routinely been invited back and even requested on many occasions. However, on my unit, I seem to never be able to do enough to satisfy someone and I always end up hearing about it going on behind my back. I don't know what your situation is but I tried for so long to be nothing but professional and good at my job and it seemed like once I found my way into their sights, I couldn't get out no matter what. I recently left for better opportunities and it was the best thing I could have done. I finally feel I am being treated like a nurse should be treated. I personally dislike med surg because my background as a medic. I was used to a much more acute setting and I dislike the lower acuity, higher patient load that med surg has. I like my ED/ICU/Stepdown, the acuity of the patients is normally high enough that I get to enjoy "nursing" instead of "tech-ing". I have no other way to say that, I know it sounds bad and is going to rub some the wrong way but I can't think of any other way to describe it. I have no problem bathing a patient, but I just like when the patient needs me medically as well. You will not learn anything in the conference room! I love having students, I plan my day around making it the best clinical experience for them that I can. I try to treat them like they are the nurse, Ill snag an extra vocera and log them in as one of the night shift people and tell the monitor tech to call them for their patients. This last clinical group we had would fight to be placed with me. But there are always the few who don't seem to want to take advantage of the opportunities that clinicals present to them. Personally, the thing that bothers me the most about "lazy" students is that they don't seem to understand that I end up having a ton of extra work, and will end up staying after 15-30mins to finish everything because I've spent the day trying to make sure that they had the opportunities available to them, and that they had ample time to learn and not feel rushed. I don't need a cookie for that, but Id like a little effort since it is the profession they chose to pursue. Im just going to throw my two cents into the ring here. I am a Paramedic. And now have been an RN for almost 2 years. I was a medic for nearly 8 years. 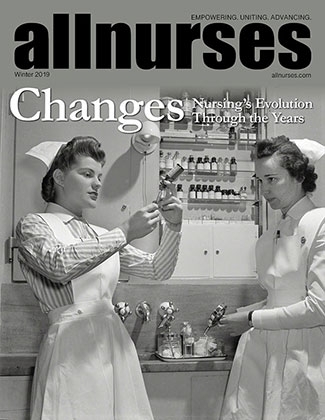 I thought I knew just how ****** nurses were and just how much better I was. I was wrong. Am I a better nurse than most because I am also a medic? Absolutely. But as experienced as I was as a medic I wasn't experienced as a nurse. I came to find that there was much more below the surface of nursing than just what I saw when I was not one. Be humble, if your attitude is coming across here without any body language etc. then you can guess that it is probably coming across to those prospective employers as well. Describe your 10/10 pain. Piggybacking off of recent pain discussions. There has to be a BETTER WAY to obtain a blood sample. You know... I had a nice long diatribe written about all the extra things I do, the time spent honing my craft and all the time lost with my family so I can help others by picking up shifts for them, or extra classes and certs to stay ahead and knowledgeable. All of that ending with a nice bit of sarcasm about how wonderful it is to have all my achievements brushed off by others who attribute my success to my genitalia and not my effort. But I’m not going to bother. I will merely say this; only 9% of nursing is male, if you think every bit of our achievement is due to that which dangles betwixt mine or their legs… Well then that’s a shame. Listen to your preceptor. Learn the rhythms. Learn the drugs. Don't slack on I&Os and Fluid restrictions. Never forget to consider the BP and kidney function in patients you diurese. Above all listen and learn. Every interaction has the potential to teach you something. With experience will come confidence and proficiency, give yourself time. House supervisor. Any time a MD (or anyone else) decides to ignore the best interests of the patient, a quick call and something gets done fast. We are pretty much the only game in town, or at least the biggest, I've seen what happens to docs who get on our bad side...They lose privileges or leave the county. Not that they don't still have 1000x more leeway than an RN... Great job advocating for the patient though! RN Salary Survey 2013: Post here! 1. FL 2. 1.5yr as RN, 8 as a medic 3. C/V surgical step down 4. $23.40 days 5. Do not recall but its for me it would be close to 5-6$ extra if I worked nights. 6. No. 3/2 house 1350$/mo. (bought when housing was outrageous here) $750-ish per mo. for health insurance for a family $3.65 for gas at the station I passed earlier tonight. Col here is pretty high since its very touristy.